At last I have finished my BA in Japanese at Curtin University and I’m looking forward to returning to my role as a Buddhist priest and counsellor, renewing my acquaintance with you and continuing our journey together. Although in many countries where the Gregorian calendar is used the New Year has already past, according to the traditional lunar calendar, we are now in the last phase of the Year of the Snake before the New Year of the Wooden Horse, which starts on February 4th. Although I have shed my University-student skin, I am still very much the student and I would like to continue to share with you the teachings that are bestowed on me. I have now set up a website, several blogs that cover my various and eclectic interests, and a Facebook page where I will be coordinating my work, writing, teaching, counselling, services, classes, etc. The Year of Snake is very much about shedding skins and beginning anew – how was it for you? I had a very auspicious sign on the eve of the first day of the New Year: I was driving home after having watched the sun go down over the Indian Ocean and toasting the old year with my husband, when across the width of the road there seemed to be a banking of white sand. It had been raining and often the sand gets washed over the road in wave-like ripples. But my husband suddenly cried out, “Stop!” And as I jammed on the brakes, we both watched in awe as an enormous albino carpet python continued its path across the road into Yalgorup National Park, adjacent to where we live. We had never seen anything like it! In Japan, a white snake is considered to be the incarnation of Kannon (Kuan Yin) and a sighting of a white snake is said to be harbinger of good fortune. What an auspicious beginning to the Year of the Snake! We hadn’t seen a snake on our block for several years because Russell has been keeping the long grass cut and the ground clear. However, in November, we were just going to bed and Russell was about to open the bedroom window when, to our great surprise, we encountered a large brilliantly coloured carpet python climbing up the window frame. Although we are quite happy to have a resident carpet python in roof cavity, where they keep away any rodents (there was one in our bunkhouse for some years), I didn’t really want to have one living in the bedroom! Russell manoeuvred it out the window and encouraged it into the garden. Now at the end of the year, we have found that there is a large dugite snake living under Wabi’an. Although dugites are poisonous, they are very timid and avoid human contact, so as long as I stomp up the path and let it know I’m coming each day, I’m not at all worried about it. In fact, according to the Buddhist tradition in Japan, it is very auspicious to have a snake living in a temple because they are considered incarnations of protector deities. 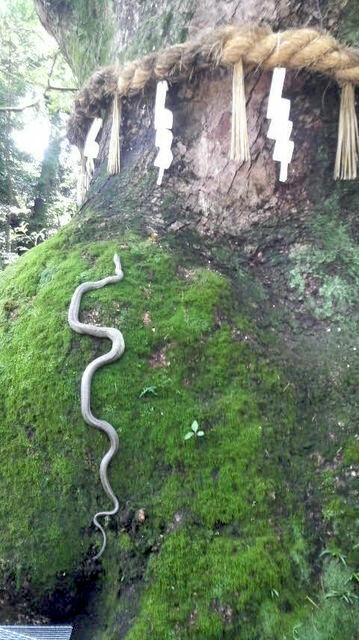 My home temple in Koyasan has a large snake that tends to curl up near the fire altar in cold weather because it’s warm. Furthermore, Wabi’an has been acknowledged by a Nyungar elder as a site that is sacred to the Wargyl, the Rainbow Serpent. It is said that the Wargyl traced a path that goes under Wabi’an, from the estuary to the east to the shore of Lake Clifton, where she laid her eggs. 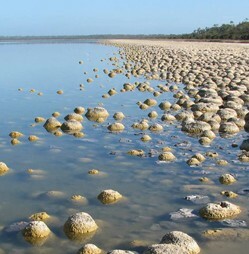 These eggs are known today as thrombolites, the oldest living organisms on our planet. So I feel very blessed to have these associations with the Wargyl and Kannon emerging in the Year of the Snake. What will the Year of the Horse hold? I’ll talk more about the signs for the Horse in a future entry in my Buddhist Astrology blog. This entry was posted in Buddhism, Spirituality and tagged Kannon, Kuan Yin, Rainbow Serpent, snake, thrombolites, Wargyl, Year of the Snake. Bookmark the permalink. Dearest Cate….my third attempt to send this to you 🙂 something about my password etc sigh. Born in the year of the Water Snake you would imagine I’d be quite comfy with a Python in my room…..you would hear me screaming from Wabi’an!!! It’s so fabulous that you will be sharing your wisdom and words with us again Cate. And your new format is brilliant…even this little techno primitive can navigate it. Thank you for kind comments Gabi – yes, the white snake that crossed our pilgrimage path at Temple 26, Ichijoji, was certainly an awe-full experience and according to the priest there, the snake was a very rare vision of a manifestation of Kannon, which Russell and I were blessed to encounter. Thank you Cate for returning to us. Nearly 5 years ago you carried my prayers for my husband to the temple of Kuan Yin. My husband has since “shed his skin” and passed away. In the year 2016, to celebrate both my and Raoul’s 70th birthdays I am taking some of his ashes on the Shikoku Trail. Thank you for your inspiration. Congratulations on finishing your BA….all that hard work and dedication will bring you great rewards…..See the snakes think so too. I too congratulate you on your academic accomplishment. I have a beautiful snakeskin hanging on my art studio wall right now to remind me of renewal. Thanks for the post. How lovely to hear from you. Having the snakeskin is a wonderful reminder of our potential to transform. How wonderful that you’ve successfully completed your studies and congratulations in mastering the complexities of the language of the holy texts. This was a huge undertaking. I’ve loved hearing your positive interpretations on snakes and the year of the snake as our family was blessed last October with the arrival of twin snakes, Lucy and Felix. They are thriving and as a little aside, remember how our little group in 2008 kindly prayed for my yet to be born grand daughter in Melbourne? Well tomorrow she starts school. Wishing you a happy year of the horse and I look forward to sharing your beautiful photography and wisdom. Thank you Laurel for your kind thoughts. That’s wonderful news about Lucy and Felix! And how time flies – it only seems like yesterday that we were on pilgrimage together, praying for that little miracle and now she’s starting school – wonderful!